Shock: It was a flight of fantasy, brought on by a drug administered by the prison’s doctor as the first step to rehabilitation. Like his drugged fellow-inmates Isaacs will soon be happy with his lot. Thoughts: An almost ‘classic’ Shock that is somewhat hindered by the writer not focusing sufficiently on the key element of his ‘shock’. Had Isaac’s fellow inmates been human their 1000-yard stares would have signalled to the reader straight away that something was amiss. Thus the shock reveal, that the prisoners were all on heavy sedatives to control them, would have been nicely foreshadowed and consistent. 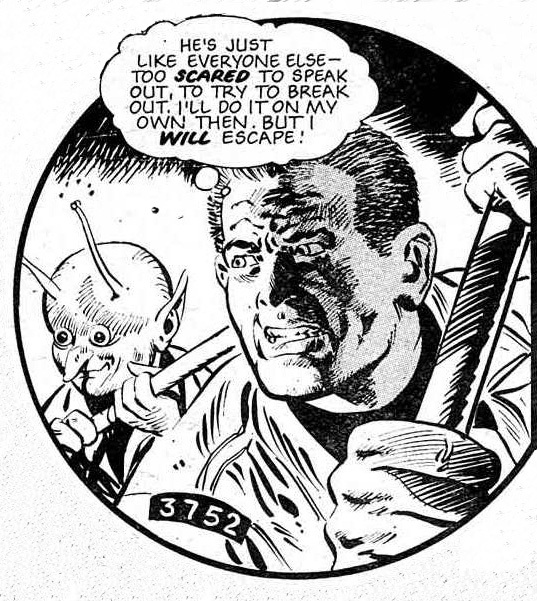 However the only inmates we see are 2 panels of Loren, who is a bug-eyed alien, and one with two other alien inmates and indeed, on re-reading, with drugged looks, but partially obscured by letter boxes, standing in the background and far too ‘inherently alien’ to suggest something is afoot straight away. Trying to convey that Aliens are themselves in an alien state of mind to their usual manner is a very difficult trick to pull off unless there is direct exposition or more time spent developing the ‘strangeness’ of the whole situation. Without this necessary base the story reads mainly as an action-adventure with the key moment the battle with the underground beast. By the time of Isaac’s escape there hasn’t been enough to suggest anything other than that the rest of the inmates are gutless. Stalwart of Spanish and British comics, Carlos Pino (Johnny Red, Invasion, Star Trek, Jonah Hex, Commando, Daily Star’s Dredd) does a sterling job on Isaacs, and draws a fantastic looking alien in Loren although his monster does look like Jimmy Saville crossed with a squid. Re-reading shows Pino is doing his utmost to suggest the aliens are acting strangely but there simply isn’t enough in the script to work with. The whole tale is nicely dark and the first time a Future Shock has dealt with the idea of ‘the authorities’ getting up to something as murky as mind-control and mass drug prescription, it’s just a shame more time wasn’t given to establishing the set-up required rather than the highly traditional flight sequences. Shock’d? : Given the flaw outlined above the doctor’s appearance is a tad left-field and seemingly only clumsily prefaced by the panel stating ‘it was like a flight of fancy‘. However had the fact that all the inmates were acting strangely from the start been better established then this reveal would have been a beautiful new dark direction for Future Shocks. Plot: On an alien world, albeit one very similar to Earth, a doughy-faced looking labourer, Klang, arrives home to be met by a barrage of tasks from his pampered corpulent wife. As he begins the domestic chores her nagging doesn’t cease. Eventually Klang turns to her.. Shock: and berates her that he only has six sets of hands. Klang, and his species, have six arms each. Thoughts: George and Mildred in Space in the hands of the wonderful Jose Casanovas makes for a classic ‘comedy’ Shock. Recycling the ‘hands out of panel’ trick of FS 6 but playing it for laughs is a nice enough move however the domestic grumbling of the gag would have been lost on a young readership were it not for the delight of Casanovas’ art. The writing itself is good and although there is nothing to the strip but the punchline, the dialogue is well done with great personality in Klang and his demanding wife. It’s quite entertaining to see 2000AD feature the line ‘Nag Nag Nag, that’s all she ever does‘ however the real star of the piece is the art. Every inch of the page is filled with loving detail and the exasperated Klang in the final panel would bring a smile to anyone’s face. Already a well-established artist across European comics this was his first work for 2000AD and Future Shocks was a series Casanovas flourished in. As with Belardinelli he has a skill for drawing the familiar everyday objects in a suitably twisted ‘alien’ form’ making every aspect of Klang’s day recognisable yet instantly unworldly. It remains a great shame that this Future Shock appears never to have been reprinted. Shock’d? : There’s no real shock, just a great sight gag that appeals to the frustrated and put-upon of every age.